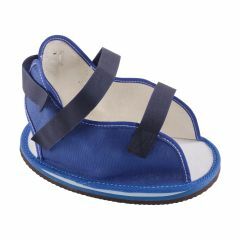 Protect your foot after surgery or an injury by wearing this special post-op shoe as you go about your daily activities. The non-skid bottom helps prevent falls and will keep your cast or bandage from getting dirty or wet when walking outside. Ideal for both men and women to wear after injuries, soft tissue procedures or post-op care. Universal to fit left or right foot. The mesh upper along with the open toe and heel provide air circulation to keep your foot from getting too hot. AllegroMedical.com presents The Protect Your Cast or BandageA foot or leg injury can be difficult enough without the added worry of falling while walking or ruining your cast or bandage. This unique post-op cast shoe from DMI® helps protect your foot while it's healing as you go about your daily activities. The non-skid bottom will help prevent falls and keep your cast from getting dirty or wet when walking outside. The open toe and heel along with the mesh upper provide air circulation to keep your foot from getting too hot. It's easy to adjust the straps to fit different size casts, too. The post-op shoe is also hand washable. The post-op shoe has a nylon mesh upper, padded insole and non-skid synthetic sole. The hook and loop adjustment provides a custom fit.